What's Your Low Sodium Program? I really like the different soups served in Chinese restaurants. I love hot and sour soup, wonton soup, egg flower soup, and corn egg drop soup. The only problem is that most restaurants over salt their broth base so much that it renders their soups almost inedible – even if you’re not following a low sodium diet. So I’ve taken to making my own versions. Easy, just as tasty, and low in sodium. I’ve been following the recipe from the Kitchn website for the egg drop soups. Its recipe is based on a recipe from Serious Eats. You can make the soup a little different each time, depending on what you have on hand or what you’ve got a hankering for. It can be as simple or as complex as you want. The Kitchn recipe uses a hint from Serious Eats, adding a bit of cornstarch in the eggs to keep them from getting rubbery. To make corn egg drop soup, I add at least 1 cup of NSA corn, either frozen or canned, to the basic egg drop soup recipe. If I’m in a particularly lazy mood, I’ll leave the corn kernels whole. But if I’m more ambitious, I will puree ½ cup in my mini food processor. The pureed corn adds an extra layer of corniness and sweetness that I find comforting and soothing. The flavoring agents I always use are ginger, white pepper, low sodium soy sauce, and green onions. I also like to include small cubes of tofu, and sometimes a handful of frozen peas and carrots. For a heartier soup, I may add some finely chopped leftover cooked chicken. The corn egg drop soup makes a great appetizer/starter to a meal or a light lunch or dinner all by itself. It reheats well too. Just heat it gently, and don’t boil it. I always add fresh green onion slivers to leftovers. If desired, puree ½ cup of corn. Set aside all the corn and add with the soup extras. Heat the NSA stock/broth over medium-high heat. Add all the flavoring extras you’ve chosen to the saucepan with the stock. Turn down the heat to medium-low and simmer for 15 minutes. If using frozen peas and carrots, cook them with the stock and flavorings. Add any soup extras to the stock and simmer for another five minutes. Save some scallions for sprinkling on top of the soup at the end. Remove about ¼ cup stock and whisk it with 1 tablespoon of cornstarch in a small bowl. Use a spoon or a whisk to stir the soup while slowly pouring in the cornstarch slurry. Let simmer over medium heat for a couple of minutes. The soup will begin to thicken a bit. Whisk together the eggs in a small bowl with the remaining teaspoon of cornstarch. Make sure the soup is at a slow simmer. Use a large spoon or ladle to gently stir the soup in one direction. Slowly drizzle the egg mixture through the tines of a fork. Let the soup stand for 10 - 15 seconds, then stir gently to break up the egg to desired size. Serve sprinkled with thinly sliced scallions. 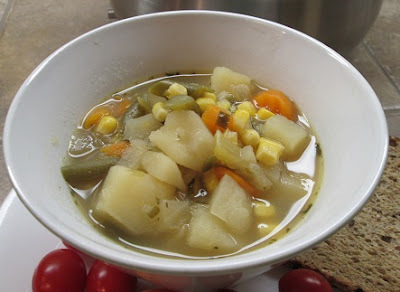 Vegetable Soup - The Easiest Ever! Have you ever got the hankering for soup but didn't have the time or motivation for a 2-3 hour cooking session? That’s what happened to me a few days ago. I wanted to make a soup that was chock full of vegetables, but I didn’t want to spend time and energy peeling and chopping. What to do? Look to my pantry and freezer, that’s what! I made the soup. It was fast and easy. And it was another Pull Out wonder – pulled out of my pantry and pulled out of my freezer. I started with frozen mirepoix – a combination of chopped onions, carrots, and celery. My local supermarkets carry store and name brands with the other frozen vegetables. And many stores also offer freshly prepared mirepoix in their produce sections. I sauted about 1½ cups of the vegetables in a couple tablespoons of olive oil. Once the mirepoix vegetables were tender, I added a 32 ounce carton of no-salt-added chicken broth along with a can of salt-free petite diced tomatoes. For extra flavor, I added some Penzey’s dried minced garlic, a bay leaf, and several whole black peppercorns (in a tea ball). I sprinkled in about ½ tsp. of savory leaves, and I threw in a sugar cube to combat the tartness of the tomatoes. I let the broth mixture simmer for 15-20 minutes before adding about 2 cups of frozen mixed vegetables: corn, peas, carrots, lima beans, and green beans. I also included one peeled and cubed Russet potato that needed to be used up. (Peeling and chopping the potato was the hardest bit of work involved in making the soup.) Then everything simmered for another 15-20 minutes until the vegetables were tender and the potato was cooked through. That was it! Vegetable soup in a flash! And, believe it or not, it was quite tasty. We were in the midst of a busy week and really appreciated having a good tasting and good-for-us soup available for quick snacks or meals. One nice thing is that the soup can be slightly different each time you make it. Use different herb blends to create different flavor profiles. Use different frozen vegetables rather than the traditional corn, peas, carrots, lima beans, and green beans blend. Try an entirely different blend or perhaps just focus on one or two vegetables. Include a bit of pasta or rice instead of the potato. Or maybe use cubed sweet potatoes for an uniquely different flavor. Maybe leave out the tomatoes altogether. Most grocery stores carry a lot of pre-prepped vegetables in their produce sections. Same with their freezer sections. Experiment. Who knows what tasty combos you might come up with? For example, this week, I made a fast corn-potato chowder. Same method but without the tomatoes. I flavored the chowder with poultry seasoning. Once I even stirred in a bit of cream just before serving. Next week I plan to make a minestrone style soup using a frozen Italian vegetable medley (Italian green beans, cauliflower, carrots, red pepper, and zucchini) and seasoned with a NSA Italian herb blend. Vegetable Soup in a Flash! Saute the mirepoix in olive oil. Once the vegetables are tender, add no-salt-added broth along with salt-free diced tomatoes. Add garlic, bay leaf, and black pepper. Add herbs of choice and sugar, if desired. Let mixture simmer for about 15-20 minutes before adding 2 cups of frozen mixed vegetables. Add options of choice. Stir and simmer together for another 15-20 minutes until all vegetables are tender. I know that finding good tasting low sodium salad dressings can be quite difficult. Not impossible, but difficult nonetheless. The safest course of action is to make your own. But sometimes it’s really nice to have a bottle of commercially prepared dressing on hand. With that in mind, I’ve looked for low sodium commercially bottled salad dressings. I’ve tried several only to be repeatedly disappointed. My biggest complaint, with both regular or lower sodium dressings, is the consistency and texture. Way too many emulsifiers and thickeners (lowfat dressings are the worst). And each stabilizer adds a strange taste that must be masked by either sugar or salt. YUCK! That’s why I was so happy to discover Tessemae salad dressings. This brand has several lower sodium options. As an added bonus, they’re all organic. Several also are dairy free, sugar free, vegan, gluten free and non GMO. My favorites so far are the Balsamic Vinaigrette (65 mg sodium/tbsp), Lemon Garlic (55 mg sodium/tbsp), and Honey Poppyseed (65 mg sodium/tbsp). I’ve found for a side salad, that 1 tablespoon works just fine. For a larger salad, I might use closer to 2 tablespoons. But even doubled, the sodium level is acceptable to me. The balsamic is a basic vinaigrette featuring balsamic vinegar and can be used in salads or just drizzled on top of vegetables. The lemon garlic dressing is good all by itself and is also a perfect canvas for just about any seasoning additions you’d want. It doesn’t have any overpowering flavor notes, so it could be adjusted to all sorts of cuisines – Mexican, Asian, Italian, and more. I’ve added a spoonful of salsa and a sprinkle of cilantro for a plain grilled chicken salad. A quick drizzle of soy sauce and sesame oil along with thinly sliced green onions creates an Asian-inspired salad. And, because of the lemon, it's great with a salad featuring any sort of fish, like tuna of salmon. The honey poppyseed has the sweetness of typical coleslaw dressing. It’s great with cabbage or any salad that would be enhanced by a sweeter, creamier dressing. I also purchased some Creamy Caesar. 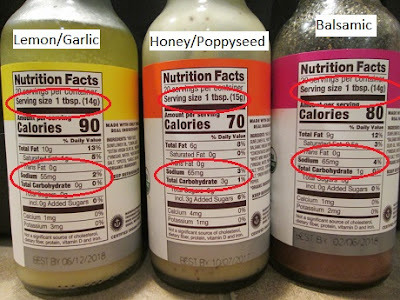 At 170 mg sodium/2 tbsp, it’s a lot lower in sodium than other store-bought Caesar dressings. It’s got a nice peppery bite too. Check out the website: Zesty Ranch & Cracked Pepper are both 65 mg sodium/tbsp, while Classic Italian is 70 mg sodium/tbsp. So Far, I've found Tessemae dressings locally at Safeway, Whole Foods, and Raley's. If you check out the website, it actually lists the stores for each separate salad dressing. Just click on the dressing you're interested in, and you'll get a page with the specific nutritional info and a listing of stores that carry that particular dressing. Tessemae offers quality products with much lower sodium than most store bought salad dressings. They can be found in the refrigerated case of most grocery store produce sections. Several years ago my husband was diagnosed with congestive heart failure and prescribed a low sodium diet. He's done very well with it, but it has been a tremendous challenge for me. Luckily, I was a good cook to start with and knew how to use a variety of herbs and spices. I've done a lot of experimenting and borrowing from others in order to keep our meals from getting boring. This blog is a record of my adventures with low sodium cooking. Hopefully, it will inspire and encourage others.